Dorsey later clarified on Twitter that he was "speaking broadly about our range of enforcement actions" with regards to the company's use of timeouts. "I don’t assume everyone will change their actions. Enforcement gets tougher with further reported violations," Dorsey said over Twitter. 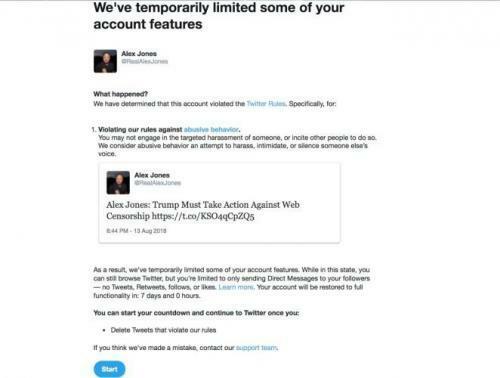 As CNET first reported on Wednesday, Jones' account was put in "read only" mode and will be blocked from posting on Twitter for seven days because of an offending tweet, the company said. While Twitter declined to comment on the content that violated its policies, a Twitter spokesperson told CNN the content which prompted the suspension was a video published Tuesday in which he said, "now is time to act on the enemy before they do a false flag"
Dorsey also told Holt that "Election integrity is our first priority this year." “We need to make sure that we are considering not just policy changes, but also product changes to help alleviate some of these concerns,” Dorsey said. When Holt asked Dorsey if conservative rhetoric was more extreme than that from liberals, the Twitter CEO deflected - and instead said it was important to focus more on actions than words. Still, after a CNN report identifying numerous past tweets from Infowars and Jones that did violate Twitter’s rules, those posts were deleted. Tweets by Infowars and Jones deleted last week included posts attacking transgender and Muslim people; a claim that the 2012 shooting massacre at Sandy Hook Elementary School was a hoax perpetrated by “crisis actors”; and a video calling David Hogg, a survivor of the Parkland, Fla., high-school shooting, a Nazi. Dorsey finally caved overnight, with a "temporary suspension", which will likely become permanent upon Jones' next violation. As Rolling Stone notes, while Jones and his sympathizers have cried censorship following the actions of YouTube, Facebook, Apple and others, internet-content platforms specifically reserve the right to suspend users or delete content found to violate of their guidelines — indeed, Infowars’ own terms of service includes such a provision. Twitter’s crackdown came more than a week after technology companies, including Apple, YouTube and Facebook removed content from Jones and his site, Infowars. As the WSJ notes, the actions against Infowars intensified a growing debate over what role tech companies play in policing controversial content on their platforms while they simultaneously support the principle of free speech. 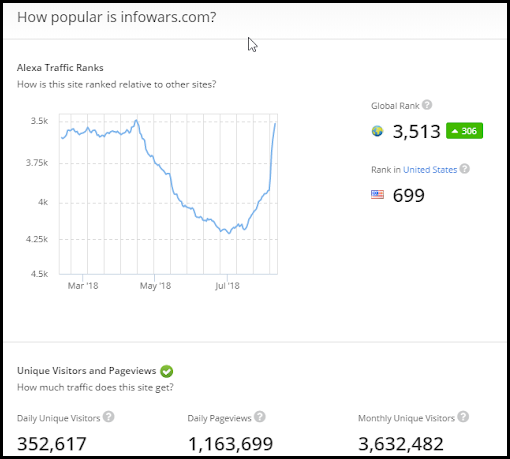 It is unclear if the ongoing censorship of Alex Jones is having the desired effect: as we noted over the weekend, Silicon Valley's coordinated purge of all things Infowars from social media has had an unexpected result; website traffic to Infowars.com has soared in the past week, according to Amazon's website ranking service Alexa.